Frisco’s abundant trees and reputation for friendly residents have long attracted homebuyers to the city’s verdant environs. Now, to satisfy the needs of increasing numbers shoppers looking for homes for sale in Frisco, more home builders are setting up shop in the city. Seattle-based MainVue Homes has acquired sites in this family friendly city north of Dallas — new Frisco houses for sale from MainVue should be available next summer. 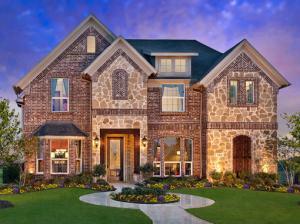 Houston-based Chesmar Homes is now building in McKinney and is looking at Frisco as a potential target. “Our attraction to the Dallas market was the strong economic growth and confidence that it will be continuing,” said MainVue’s president, Vanessa Normandin. Sales for single-family homes in North Texas topped the billion dollar mark earlier this year, according to research from the Real Estate Center at Texas A&M. This is unsurprising, given that Frisco’s population tripled to 102,000 in the 2000s. The university’s research also shows that 30% fewer homes were for sale this year compared to last year. And with Frisco’s population continuing to grow at around 5% year, according to city planners, more homes will be needed to accommodate the new residents. To help fill the need for more homes for sale in Frisco, other out-of-state builders, such as Arizona-based Taylor Morrison and California company Ryland Group, have recently purchased Dallas-area home building companies. Buying an existing builder is a quick way into a market, experts say, because acquirers get instant access to home sites and to industry talent. This facilitates efficient expansion, and generates more home inventory more quickly. Established area builders such as David Weekly, Landon Homes and Holiday Builders have offered houses for sale in Frisco for some time. Many of these builders are ramping up their efforts by more quickly adding additional phases and increasing the rate of house starts.